Floods used to be a regular and catastrophic fact of life in wet southern China, where the mighty Yangtze River regularly burst its bounds in the spring. Anti-flood preparations and economic growth have helped limit the worst damage in recent years, but water won't be denied. 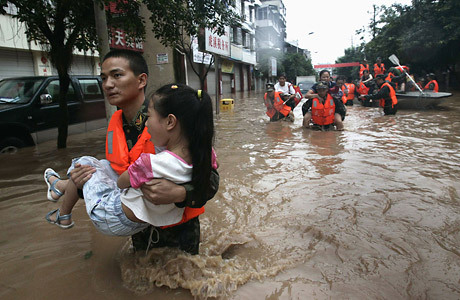 This June days of drenching rain led to floods and landslides throughout southern China, including the prosperous manufacturing province of Guangdong. More than 60 people were killed and half a million were forced to flee their homes; economic damage was estimated at nearly $400 million.